Order your copy of The Healthy-Aging Diet today and discover how eating right can keep you strong, healthy and vital for life!! Discover how eating right can keep you strong, healthy and vital for life! 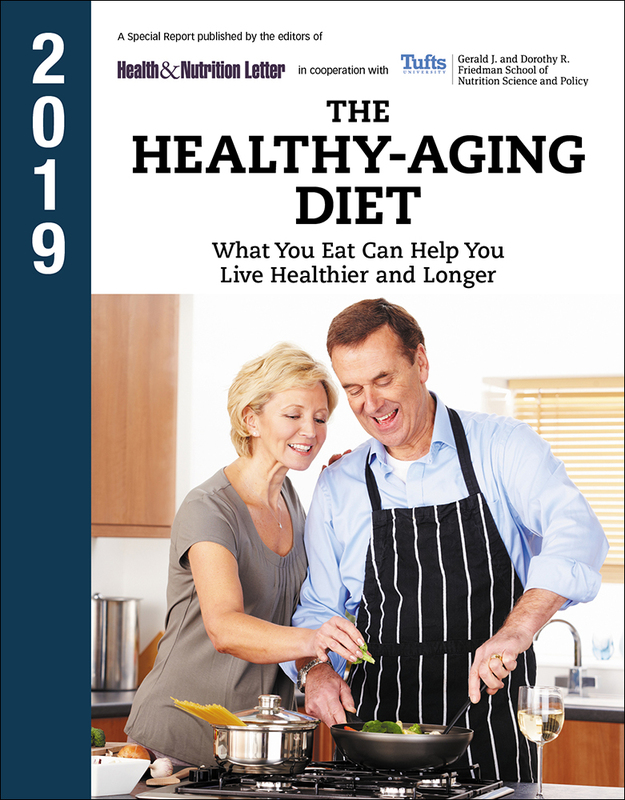 Order your copy of The Healthy-Aging Diet today! You probably know that what you eat and drink can make a huge difference in your health, but did you know that no matter how young you feel, your body’s nutritional needs change as you age? It can be a real dilemma for those of us over 50, because we need more nutrients, but fewer calories, to stay healthy. That’s why the experts at Tufts’ Health & Nutrition Letter created The Healthy-Aging Diet. This new report reveals the healthiest foods and diet plans that can help you lose weight, prevent type 2 diabetes, lower high blood pressure, prevent heart disease, and more. You’ll see how 5 common, chronic health problems for people over age 60 can be prevented or reversed through healthier eating. And that’s not all. You’ll find the latest research information that shows you why getting more low-fat dairy in your diet is linked to a reduced risk of frailty and may reduce the progression of osteoarthritis. You’ll find the best ways to get more protein in your diet—it’s critical for helping you live on your own and stay independent, and more. It’s shocking, but true. Many of the diseases people suffer from as they age could be prevented or even reversed by eating healthier foods. And you don’t need to overhaul your whole diet. Making just small changes can make a dramatic difference in your health. To help you choose food and drink that can improve your health, the editors at Tufts’ Health & Nutrition Letter created an all-new report—The Healthy-Aging Diet, which is available to you at the lowest price you’ll find anywhere. The cost is a very small price for information that can make such a large difference in your life or that of a loved one. Order today and if the report doesn’t match your expectations, let us know and we’ll fully refund your money, no questions asked. So, come and get it! Send for your risk-free copy of The Healthy-Aging Diet today!